First, lemme start off by saying I love front load washers. I think they offer the best clothes washing technology out there combining low water use with a gentle tumble wash that’s easy on the fabrics, making your clothes last longer, and does a very thorough job of cleaning the clothes compared to the high efficiency (HE) top load washers. We’re a family of five with dogs and cats. We’ve used a front load washer for many years at our house and, aside from routine repairs, have never had any washability or odor complaints. You’ll hear some people complain about these issues with their front loader but, in almost every case I’ve seen during service calls, it’s been due to user error– usually using too much or the wrong type of detergent. Okay, so front load washers: rah-rah, go team go. 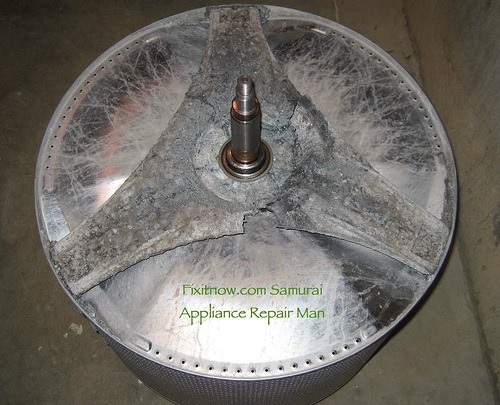 Why have a special post dedicated to front load washer drum bearing and inner basket failures? Because these failures are usually considered a “total” event (as in “Dude, I totalled my car last night”) by professional Appliantologists due of the huge cost of the repair. Not only are the parts expensive (sometimes more than $500) but the job itself can take more than three hours (depending on the particular nightmares you run into) and usually require a second man… or one with a very strong back, though it may not be after completing one of these repairs solo! Everything is repairable. The question is: does it make economic sense to do the repair? 1. You are going to do the repair yourself, so you’re only paying for parts. 2. The machine is still under full or partial manufacturer’s warranty and some or all of the cost of the repair will be covered. 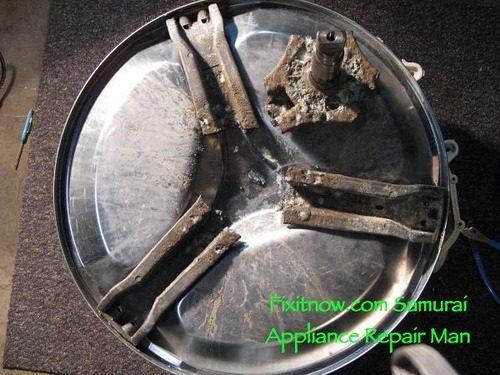 So, if you’re in a situation where neither of the above conditions apply, wouldn’t it be nice if you could positively diagnose a bearing or basket failure on your own and at least save yourself the cost of a service call? Ya sure, ya betcha! And hence, the raison d’être for this post. Okay, enough talk. Let’s do some basic watching and listening. – Dissimilar metals used in the support members vs. the basket metal itself. – Certain combinations of hard water and detergents. – Running the washer on a non-grounded or improperly grounded outlet. Regardless of the cause, which is a whole separate and interesting engineering discussion, if this happens to your washer, your immediate tasks are to 1) properly and positively identify this failure and 2) decide whether to repair or replace based on the economics of the situation. Ruh-row, trouble in washer-land! These drum bearings are factory-pressed into the back half of the drum. So it’s not like you can buy a set of OEM bearings, pop ’em in and off you go. You have to replace the whole drum, at least the back half, with the factory-installed bearings. Problem is that you’ll usually find the drive shaft on the inner basket so corroded that you’ll need to replace the inner basket at the same time. Double whammy! If you look around the Internet, you’ll find third-party bearings that claim to be a drop-in replacement for the factory-installed bearings. I’ve not heard of a single case of this repair lasting more than a few months. If you’ve done this repair and have gotten longer than a year out of it, send me proof and you’ll be a rock star. The reason these third-party bearings have such a dismal reliability record is because the tolerance on these bearings is astonishingly tight. When you consider the pressure and speeds that these bearings need to work in, it’s amazing they last as long as they do. These bearings are actually a precision-machined piece and that’s why they have to be installed at the factory for maximum reliability. This entry was posted in Blog on December 30, 2013 by Sam Weldon Brown.